Do you love theatre and the magic of live performance? Are you looking for an opportunity to contribute to your community while promoting the arts? We could not do it without dedicated volunteers who believe in and support our mission in a variety of ways. Their time, commitment, positive attitude and personal support of the Port Stanley Festival Theatre and the work it produces, allows us to provide a warm and welcoming environment and top quality patron service. No previous experience is necessary. 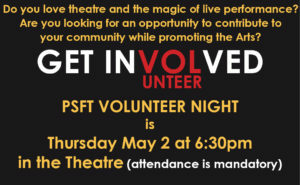 We are looking for volunteers with passion and curiosity for the theatre. You must be reliable and committed as well as friendly, courteous and respectful with our patrons.